Everything you need to know about one of the world's most popular operas. You know you’re listening to Puccini when you have: big sweeping tuneful melodies combined with stories about ordinary people. It’s a common tale! La Bohème has inspired all kinds of adaptations. Seen Rent? Jonathan Larson’s 1996 smash-hit musical borrows several characters and plotlines from Puccini’s smash-hit opera. Baz Luhrmann’s award-winning film Moulin Rouge also borrows a bit from the Puccini classic (that Luhrmann made his name directing for Opera Australia in 1990). 'Musetta’s Waltz' is a standout in the score. It is the theme song in Moonstruck and is often referenced in movies, television programs and advertisements. It was also a hit pop song in 1959, when Della Reese released 'Don’t You Know'—based on Musetta’s famous tune. Puccini sets the scene with music, so listen out for sound effects. At the beginning of Act III as snow begins to fall on stage, the flutes and the harp take up a beautiful melody. Soak it up—it captures the feeling of fresh snow flakes on cold noses. Director Gale Edwards has moved the action to 1930s Berlin, among the social upheaval of the last months of the Weimar Republic. It’s a gift to the designers (sets: Brian Thomson, costumes: Julie Lynch), who have drawn a world of sumptuous velvet and glittering fairy lights. Marcello paints his work upon the walls of the bohemian’s freezing garret, while the Café Momus is a hedonistic wonder of revolving balconies, fringes and fishnets. The librettists Illica and Giacosa adapted a popular novel (then play) by Henri Murger about Bohemian life in 1840s Paris. Puccini began working on the opera, enraging a fellow composer, Leoncavallo, who claimed to have been working on a similar libretto first! 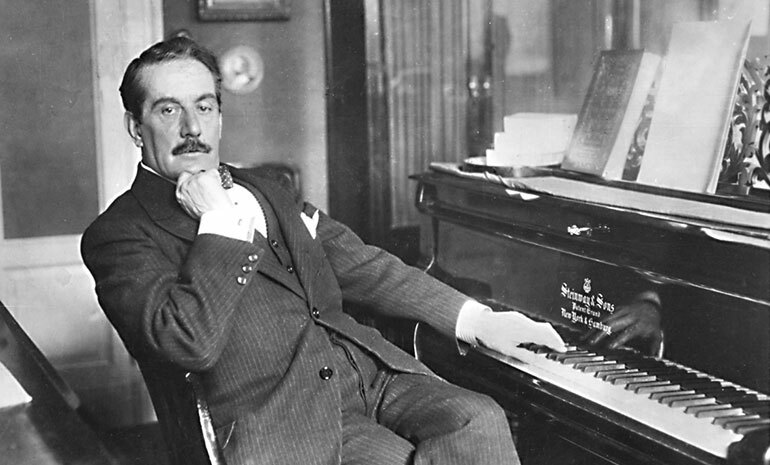 Puccini declined to cease writing, saying, “Let him compose, and I will compose. The public will judge.” They did. Leoncavallo’s version is all but forgotten. Puccini's new opera premièred in Turin in 1896 and after a mixed reception, it became a runaway success. By 1900, it had been performed in many of the leading opera houses across Europe and the Americas by some of the stars of the day. Dame Nellie Melba sang Mimi for the Royal Opera House in Covent Garden. The young Arturo Toscanini conducted the world première. An original poster for La Bohème, illustrated by Adolfo Hohenstein and published in 1895. While the opera has four acts, Puccini didn't call them “acts”. He thought of them as “images”. 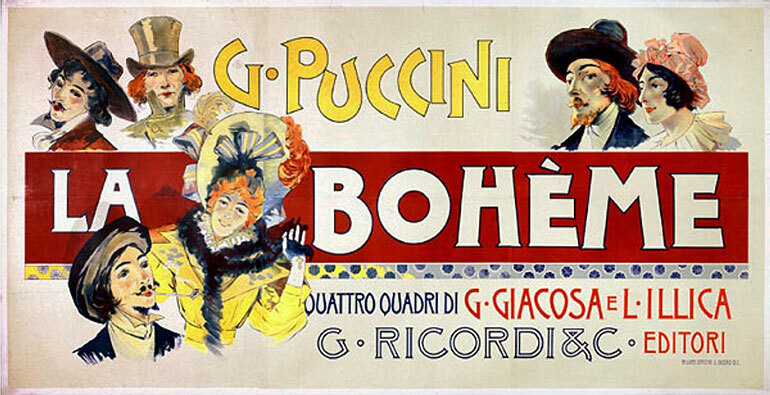 Puccini’s opera omitted one of the acts prepared by the librettists. In the missing act, Mimi dances with a Viscount at a party and thus sets the scene for Rodolfo’s terrible jealousy in Act III. The composer: Puccini. Italian. Late 19th Century. Also famous for Madama Butterfly and Turandot. The big hit: Full of the kind of tunes that tug your heartstrings, the most famous is probably 'Musetta’s Waltz'. 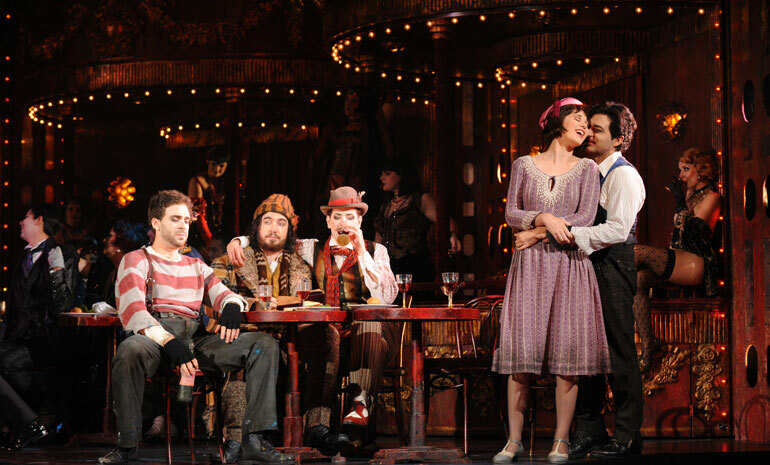 The spin-offs: RENT: The Musical and Moulin Rouge both owe lots to Puccini’s La Bohème. A quirky fact to impress your date: Puccini decided to cut the opera by one act, removing a vital part of the story. If you’re wondering why Rodolfo gets so jealous in Act III, it’s because in the missing act, his lover Mimì dared dance with someone else at a party!